One of the things I've wanted to do for years is to paddle on the Willamette River in Oregon. We brought the boats this year with the idead of paddling around Ash Island near Dundee, but it was too cold for the Arizona weather wimps when we were through here in late April so we came back to try again as we started our homeward trek. Our paddling buddy, Ian, and his daughter-in-law, joined us for the paddle. BJ and I were double-tasking - wanting to do the paddle and hopefully locating some geocaches on Ash Island. The river pools up along this section, resulting in minimal current, especially on the inside of Ash Island. The heron looked black but was big enough to be a Great Blue Heron - it's a bird of some sort. This area had lots of different birds, but no knowledgeable birder on this day trip. The pilings from the old docks that had lined the area at one point made for interesting reflections, and marked our launch point. We paddled from the launch to the northeast end of the island and then started circling the island counter-clockwise from that point. Some northwest geocaches are very well protected! The nettles were well over six feet high in places. If that wasn't enough, you could also choose to try to pick a trail through the old logjams that had grounded on the island. so we elected to enjoy the rest of the paddle without the interruption of trying to locate caches as well. On the far shore is a ferry landing that they use occasionally to bring farm equipment to the island. 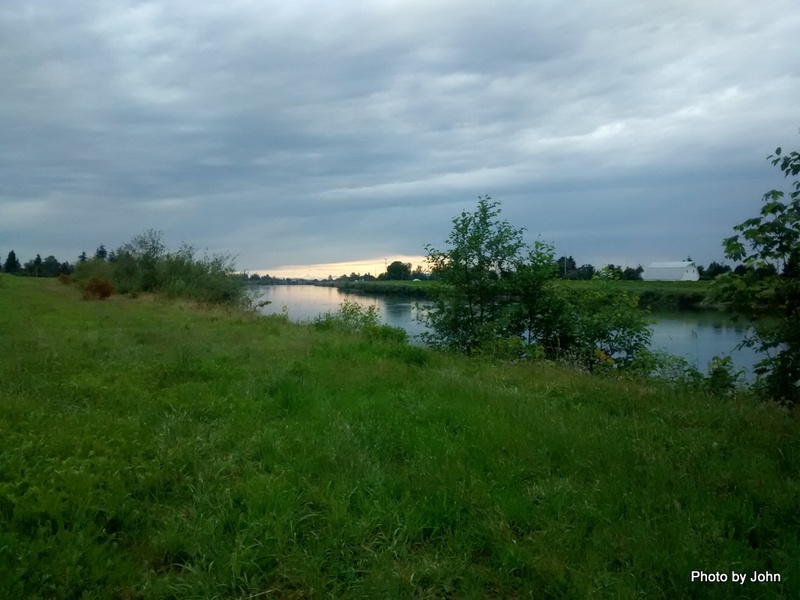 Once the river level decreases from the spring high water, the center portion of the island is farmed, although you'd never now it from the edges except where the irrigation pump is set up and the ferry landing is located. We were mooned by the young ones in a gaggle of geese. By the end of the trip, we were passed by a handful of power boats headed up river. On the inside of the island, we pretty much had the river to ourselves, but it won't be long and the seasonal kayak & canoe rental will be in operation at the launch site, insuring the area will be busier. 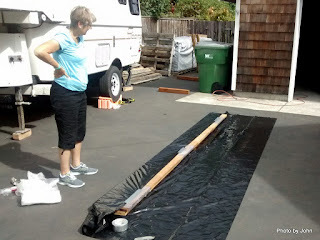 When we got back to our moochdocking location, BJ helped me wrap up Kathy's canoe - at least we expect the lumber to turn into strips for a solo canoe next winter. 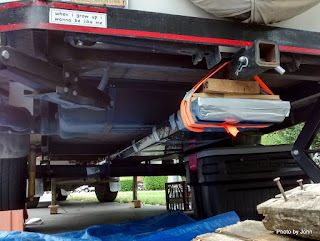 The bundle was suspended under the trailer where it rides securely for the trip from the northwest back to Arizona. Thanks to the trailer's torsional axle and the lift that we put under it a couple years ago, we have almost 3" of clearance to haul some choice boat lumber. But You Won't Recognize It! My roots are in the Skagit Valley but we haven't lived there for about 40 years. We've been back, but typically for just a day here or there. This time, we spent the better part of a week in the Valley. The old grain elevator, which had been unused for years, has now been gussied up and turned into retail and restarant space. They've grown flower bulbs in the valley for at least 75 years, but now Mt. Vernon is known for their tulips and their springtime Tulip Festival when traffic goes from bad to a nightmare. The Carnation plant may be partially gone and the stack 30' shorter than it used to be, but now it sports tulips on it. They even have tulips formed into the concrete of the crosswalks! All the buildings on the west side of Main Street are now gone. Instead, the area features tulip art and a beautiful floodwall system that reduces (some say eliminates) the need for 24 hour sandbagging marathons. Even the alleys are looking spiffy. Since we had time, we went looking for some of the houses in my history. The house I came home to when I was born looks better than it has for years, and is apparently being used instead of sitting empty like it did for decades. The house I think of as "home" where I spent the vast majority of my childhood has the same roofline from the front, but the landscaping does a great job of hiding it except from one minor angle. Someone has replaced all the windows which I assume reduces the drafts that I remember as a kid. I think removing the double-hung windows removed lots of the house's character. The house is totally unrecognizable from the back door. Portions are gone and the roofline has changed. I'm glad somebody has put some effort into it, but I sure don't understand the massive trees and bushes that hide it. The old barn is gone, and the dairy barn built in the late 40's is nearly inaccessible with the trees. The tree at the front corner of the barn didn't exist when I lived there. Hope it doesn't crack the foundation. The house that BJ and I first lived in looks the same if you catch the angles between the 20' high hedge. This place is less than 1/2 mile from some of the most famous tulip operations. I'm glad I don't have to fight that traffic to get home! We lived on Camano Island for a short while in a cute little bungalow that was likely built as a beach cabin. It, too, was hiding behind high, overgrown hedges. The yard and newer garage were full of junk. Clearly, nothing stays the same. Actually, that might not be true. The rain was the same. Burlington was celebrating what they used to call Berry-Dairy Days, now just Berry Days. The rain seemed appropriate - I think it always rained during berry picking season. We had a lot of fun taking part in the geocoin challenge that the Mount Vernon Parks department has put on for several years. The umbrella was essential equipment to keep the cache logs dry while signing them. The base coin was very nice and featured a second layer with a circular moon that you earned for completing the night caches portion of the challenge. Once you got away from the houses, the river looked very much the same. Someday I'm going to come back with the right kayak to float the lower Skagit. The best part was than when the sky cleared, Mount Baker was seen in the distance. When I see Mt. Baker, I know I'm home. After a week of fun in the Port Townsend area, it was time to head for the other side of the Puget Sound. We could have driven around, through Tacoma and Seattle, but it was well worth the $75 to take the ferry across to Edmonds and avoid the traffic and miles. 'Sides that, we were able to moochdock at my sister's overnight, checking out the new space that just fits our rig for future reference. Just because we were now on the east side of the sound didn't mean that we'd magically gotten out of the rain. Amazingly, as dark as this looked, we didn't get much on the freeway as we headed north to the Skagit Valley. This is the first time in several years that we've seriously wandered the back roads of the Skagit Valley. Perhaps the most surprising to me was the almost total lack of dairy farms. The first generation barns were mostly gone, or well on their way. The second generation barns were closed up or used for storage. In all the driving around, we only spotted one operational dairy farm. I'm not sure where they get the milk that's sold in stores. Maybe it really does come from factories like the city kids think. Rivers are serious around here. Seems like most every year, the river elects to expand its horizons for a little while. The channel was running a bit higher than I expected to see it this time of year. It's behind the bushes but this side of the church. We spent three nights in Sedro-Woolley, where at least one sign has grown into the tree, and is notably higher than when they first took advantage of the tree to avoid putting in a sign post. They're still trying to figure out if Sedro-Woolley is one word, two words, or hyphenated. It's been one town for nearly 120 years. The City of Sedro-Woolley has taken advantage of some of their riverfront land to create a very nice Riverfront Park and included an area with 32 site for RVs (W/E) and tents. It's a very basic park and does not have a water view, but it's very inexpensive. $15 per night for the water/electric sites - no discount for seniors. They don't have a dump, but the city has a free dump at their wastewater treatment plant. The RV park has a feature different from most. The power boxes are mounted about 8 feet above ground level. Each power box pole features three steps so that you can reach the box to plug in. The tent sites are $10 and don't have power, but do have water which makes a nice place to tie off the tarp that goes over the rain fly when camping in Washington. The weather did clear one day enough that I was able to get a kayak on the water and get my first 5/5 (max difficulty, special equipment terrain) cache. It started raining again as I got back to the truck, but who cares? While I was launching and landing I enjoyed watching the bald eagle who was keeping an eye on "his" lake. In spite of the cooler and wetter weather than I anticipated, I was still enjoying the chance to wander around old stomping grounds. 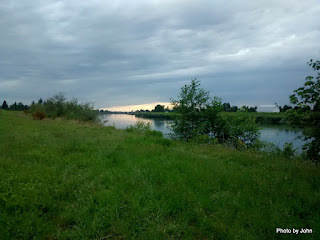 One day, we headed towards the marina to see if we could find some geocaches before the rain. The first geocache was easy, except for the dogs off leash by the sign that said there was a $114 fine for having dogs off leash. With Turk's history, we tend to be very cautious around dogs, especially dogs who don't pay any attention to their owners. We'd parked near the second cache to walk down to the first one and realized something unusual was going on. The boat lift gantry was moved out of the way, and a very wide pilothouse structure had been backed onto the dock, along with a mobile crane. We looked for the cache for a bit, but it was much more fun watching preparations. It was clear they were planning to lift this structure, but to where? snubbed the tug to the side of the barge so he'd be able to see once the pilothouse structure was loaded. the rigging was attached to the steel frame the pilothouse had been built on, and lifting commenced. The structure was pretty big. I estimated the width at about 24' based on the width of the trailer, and the length about 40' or so. 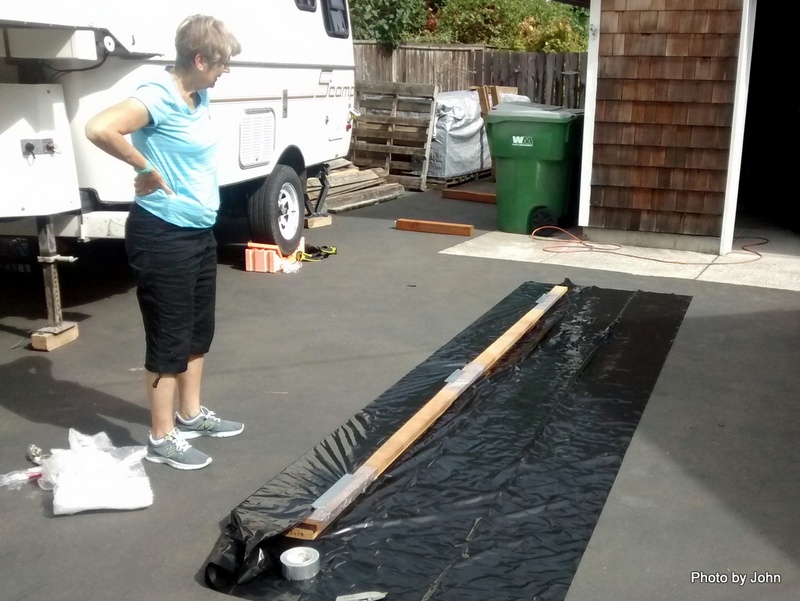 Turns out, the pilothouse is going to Seattle where it will be loaded on an ocean-going barge destined for Hawaii. With the pilothouse in place on the barge, we headed off to find a couple more caches before the rain. Based on the comments during the loading process, and this one clue spotted on the front of the frame, I'm betting this will form the upper deck house for an inter-island boat in Hawaii. Wouldn't be surprised if it will be used for whale watching or dinner cruises. Wish I knew more.